“It’s a drop in the bucket,” Marin County Supervisor Dennis Rodoni says. 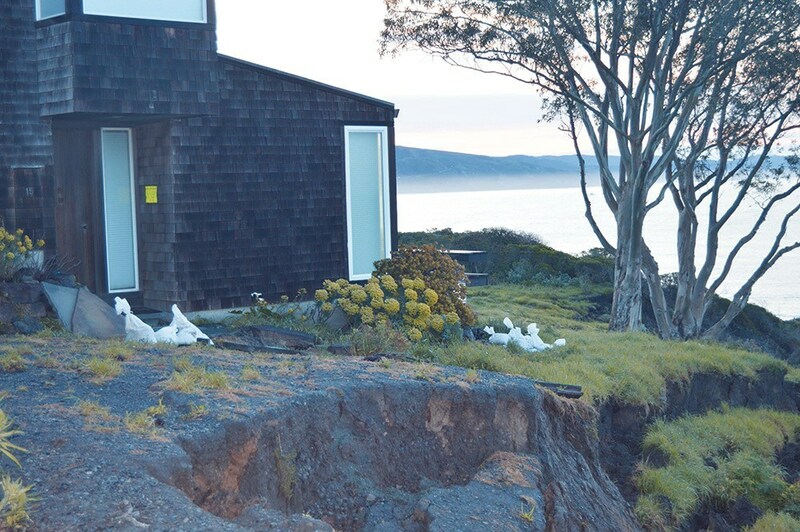 The 4th District representative made the rounds in West Marin over the weekend and talked about news of a new $3 million Federal Emergency Management Agency grant that’s being made available to homeowners who live in flood-prone zones in the county’s unincorporated parts. It’s a drop, sure, but it’s a welcome one to county officials trying to assist flood-prone homeowners through the Local Hazard Mitigation Plan. And yikes—it’s still raining and flooding this week as the county is now in the process of reviewing dozens of applications seeking a piece of the grant, most of them from the coastal towns of Marshall (15 applications) and Stinson Beach (17 applications). The rub is that not all of the applicants are in a FEMA flood zone area or in a future sea-level-rise area identified by the county in a pair of vulnerability assessments it produced in 2017. They won’t qualify, even if they’re at risk, too. One vulnerability study determined that future sea level rises in Marin County could, under one scenario, spike by ten inches. Add in a 100-year storm surge and it’s estimated that 8,000 acres of land would flood and 200,000 residents would be displaced or otherwise be impacted. Three ferry landings, five marinas and numerous boat launches would be under threat, commuting employees could be stranded and some 4,500 homes would be flooded. The current FEMA grant to raise houses to a safe level would be spread across an estimated maximum of 16 homes. A bucket’s drop indeed—but the county says there’s more on the way. This latest grant opportunity comes as Marin County weather-related events this winter—mudslides in Sausalito, levee breaches in Novato, houses poised to hit the beach in West Marin—are underscoring a regional push to deal with climate-change impacts on storm seasons and anticipated sea level rises. Nobody’s denying climate change in these parts and if they are, they’re drowning under a sea of observable realities. The buzzword du jour from all quarters these days is resiliency—but can the county keep pace with its visions of resiliency, given the looming sea-level-rise peril? The deadline for the West Marin FEMA grant was March 22 and the Marin County planning office tells the Pacific Sunthis week that they’ve received 39 applications for the $3 million grant to raise houses along the Marin coast. The maximum grant to any household is capped at $243,337, and the homeowner is required to be able to contribute 25 percent of the cost of elevating their structure. The county currently offers no funding boost of its own to assist homeowners of lesser means who are at risk of flooding, but says it’s open to the idea. The funds are part of a FEMA program designed to build resiliency in parts of the region at risk of flood and fire. The grant, says Marin County Planning Manager Jack Liebster, came about as a result of the state Disaster Declaration that attended the 2017 Sonoma and Napa county wildfires. The opportunity sprang from the ashes of fire disaster, but localities have the flexibility to deploy the funds to meet local resiliency shortfalls as they see fit. And while it’s true that Marin County’s been described as a “sleeper county” to the extent that it’s overdue for a big wildfire—concerns about flooding and sea level rise are a graver and more real-time threat that’s already affecting the county. The latest grant is pegged to unincorporated West Marin and is for homeowners in the special flood hazard zone. It’s aimed at helping them get their houses raised above the so-called 100-year-storm line. While it does seem that 100-year storms are occurring every winter, the metric actually refers to the 1 percent statistical probability that a killer storm will hit in any given year. Meteorologists may need to upgrade the metric as storms quicken and intensify. Marin County homeowners in high-flood-risk areas are subject to a county code that requires homes to be built at least a foot about the 100-year-storm high-water mark. To counteract future predicted sea level rises, the county also encourages anyone near the shoreline to build or raise their home two feet above the 100-year mark mandated by county code. Homeowners in those areas are required to carry pricey flood insurance. Marin County has gotten two FEMA resiliency grants recently; the other is pegged at flood-prone properties in the eastern part of the county. As Liebster explains, federal funding is provided under the authority of the Stafford Act through FEMA and the Governor’s Office of Emergency Services (CAL OES). The state agency is responsible for identifying program priorities and reviewing sub-applications. They forward recommendations for funding to FEMA. The federal agency has the final say over eligibility. As the song goes—it kept on raining, and the levee broke. On Valentine’s Day, a sloppy and windy pineapple express roared through the region and breached one of two levees that hold back the engorged Novato Creek. The breach closed State Route 37 between Highway 101 and Atherton Avenue—aka, the Narrows—for several days, snarled traffic and frayed nerves of commuters up and down the North Bay.